The RJK group of industries started out as a trading company with a substantial capital in 1945 under the stewardship of Late Shri Ramniklal Jivanlal Kinarivala. He was a technocrat and a visionary whose philosophy was this simple equation: QUALITY + SERVICE = CUSTOMER SATISFACTION. In the fifties the RJK group diversified into manufacturing of S.S. / Bakelite Sleeves, Bakelite Drums and Chlorine Gas Cylinder Valves. It was in 1970s that the RJK High Speed Manual Cone Winder was launched. 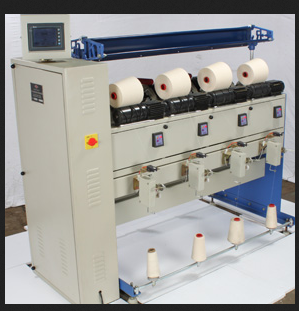 This machine was so overwhelmingly successful in terms of smooth operation productivity and the quality of packages produced and was so well received by the entire Textile Industry that it soon became the leading Manual Cone Winding Machine in INDIA a position and reputation it enjoys even today. The ‘80s saw the launch of RJK High Speed Doubler / Parallel Winder and the RJK Pneumatic Yarn Splicer for single yarn. Both were instant successes. The ‘90s saw RJK Cone Winder being exported to the Asian and African sub-continents as well as to the far-east countries like Indonesia. Also developed and marketed the RJK Pneumatic Double Yarn Splicer. Today, RJK also offers, rather proudly, a Hand Splicer for Polyester / Viscose Filament Yarn as well as for Cotton and Cotton blends comparable to the best in the world. Achieving customer satisfaction through quality, service and continuous R & D is what has always mattered the most at RJK in this long journey spanning over five decades.